Henry and I believe strongly in the ‘Reduce, Reuse, Recycle’ principle. Long before starting our business, 20 years ago, we were dedicated to protecting our planet through Green practices. When the opportunity to become a Green Certified Business arose we said, “Pick us! 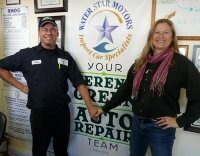 Pick us!” We were the first Green Certified Business in Santa Cruz County. That was April 2004. Now the City of Santa Cruz has taken over the program and we have now re-certified for the third time. Interested in being certified as a green business? One key change in becoming Green was to replace all of our light fixtures with new, more energy-efficient ballasts and bulbs. This saves about $60 per month in our electricity bills. The energy usage difference after upgrading was 5kwh/day less. 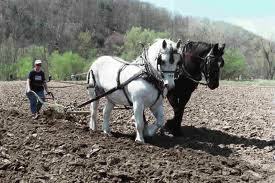 horsepower is equiva1ent to how much work per time a medium sized horse can produce pulling a plow. One horse-power = 746 watts. A person in good shape can produce about ¼ of a horse power (200 watts). So if you hook your exercise bike to an electric generator you could power 2 light bulbs or a light bulb and a TV – But for only for as long as you keep pedaling! Wow, if each American household swapped just one light bulb for a compact fluorescent bulb, the energy savings would be equivalent to 300,000 barrels of oil per day! The Greening process: We improved our habits of recycling cans, bottles, cardboard, metal, etc. We held a recycling training meeting with our staff. We added places in the shop and office where paper can easily be recycled. In our office, we print on the other side where applicable. Other simple changes: We put mulch around our plants in front of the shop; switched to bulk recycled toilet paper from Coast Paper; put a water restrictor in the sink, and a low flow flapper in the toilet. Think about the philosophy, ‘cars can be immortal’. Instead of junking your car after a few years consider them as potential life-time partners. By far, the most economical way to “produce energy” is not from oil, natural gas, bio-diesel, hydroelectric power, solar power, wind power, or fuel cells, etc. but by conservation. In other words, it’s far more economical to turn down your thermostat or carpool to work, ride a bike, turn off the hot tub or hang the clothes out to dry than it is to drill another oil well, build another dam or put up another wind turbine farm. Reduce, Reuse, Recycle! What can you do today to help our planet?